Your Droid X allows you to configure e-mail accounts you access from the phone. 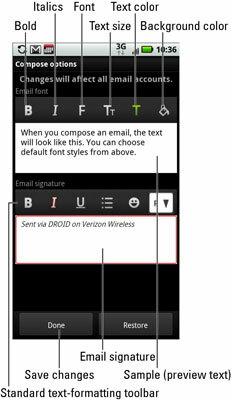 You can create a custom e-mail signature that appears on messages you send from your Droid X, among other setting options. Press the Menu soft button and choose Settings from the menu that appears. If you see no settings, choose Back to Inbox and repeat Step 2. Type or dictate your signature. That signature will now be automatically added to the end of all the new e-mails you create. Edit the Email Signature area to reflect your new signature. The preset signature is Sent via DROID on Verizon Wireless. Feel free to edit it at your whim. Press the Back button to return to the message, where you can touch Cancel to stop composing a new message. The signature you set appears in all outgoing messages. Choose Email Delivery on the Email settings screen. Put a check mark by Data Push. Choose the Fetch Schedule item. Set the frequency with which the program checks your e-mail account. Choose Email Notifications in Gmail, or Notifications in Email, to have the phone alert you to new messages. Specify whether the phone vibrates upon the receipt of new e-mail by choosing Vibrate. The ringtone and vibration options are available only when Email Notifications is selected.